I am unabashedly fond of Khushwant Singh's writing. His interests are varied; liquor and women have obviously their places. He is also fond of Urdu. The language has a literary heritage of love, the beloved and wine. The imagery of the passion and pains of love in Ghalib's poems draws enthusiastic followers for Urdu. Khushwant is a modern day fellow traveller of Ghalib. Both of them are absorbing in the brilliance of their unbound mind. Ghalib's passion and pride even take on the world with his lofty expression 'Chorunga main na us but-e-kafir ka poojna/Chore na khalq go mujhe kafir kahe baghair' (I will not relent from worshipping the image of my beloved / and the world will not leave me alone without calling me a heretic). The elegance and the enlightenment of the Mughal court found its way into the language of Urdu. And it is in northern India that Urdu found permanence. It may not be the state language of India but Urdu language has many admirers and practitioners in its northern half. Urdu is associated with courteous manners and cultural enlightenment. The use of few lines of a 'sher' (love couplet) is widely applauded, be it in a public meeting or in a film. Even a typical Bangali leader Mamata Banerjee found it handy to quote few lines of an Urdu poem to enthuse the crowd speaking with flourish, 'Raushni Chand se hoti hai/ Sitaro se nahi/ Mohabbat ek se hoti hai/ hazaro se nahi. Brightness comes from moonlight/ not from the stars/ True love can be with one and only beloved/ Not with thousands of them. The flourish is much spectacular when late Raj Kumar in his inimitable voice utters with great histrionics the first two lines of a poem by Jigar Moradabadi, Hamko mita sake ye zamane me dam nahi/ humse zamana khud hai zamane se hum nahi' (The times do not have the heart to destroy me/ the times we behold are my subjects and I am not among their servitors). It was during the declining times of the Mughal rule, Urdu developed into eminence. The last Mughal ruler Bahadur Shah II was himself a keen Urdu poet. He used the 'takhallus' or pen name Zafar. Unlike Ghalib, Bahadur Shah Zafar cultivated Urdu within the bounds of social standard. Neither did he drift in matters of principle. When it came to judging a righteous man he was upright to the point of saying, Zafar aadmi usko na jaaneye gaa, ho woh kitna sahib-e-fehm-zakaa; Jisye eish mein yaad-e-Khuda na rahee, jise teish mein khaof-e-Khuda na rahaa' (Zafar, no matter how smart and witty one may be, he is not a man / who in good times forget God, and who in anger did not fear Him) It is however the mournful contemplation of his tragic fate in exile that lives in the grieving hearts of people all over the sub-continent. We grieve to listen to his wailing heart as we read his epitaph: 'Lagta nahi hai jii mera ujray dayar mein/ kis kii bani hai aalam-e-na-payedar mein// kah do in hasraton se kahin awr jaa base/ itnii jagah kahan hai dil-e-daaghdaar mein// umr-e daraaz maang ke laaye the chaar din/ do aarzu mein kat gaye do intizar mein // hai kitna badnasib Zafar dafn ke liye / do gaz zamin bhi na mili ku-i- yaar mein' (My heart is not happy in this despoiled land/ who has ever felt fulfilled in this transient world/ tell these emotions to go dwell elsewhere / where is there space for them in this savagely scarred (bloodied) heart/ I prayed for a long life but got a life of four days/ two passed away in aspiring to be, and two in waiting / how unlucky is Zafar! For burial / even two yards of land were not be had, in the land (of the) beloved). Zauq or Ibrahim Zauq (1789-1854 A.D.) was the tutor of Bahadur Shah Zafar in the style of poet laureate. He indulged in philosophy and had a melancholy outlook on life. The tutor's mental make up influenced the poems of his student. The unjust nature of life saddened Zauq. He spoke of the ironies of life and death by: 'Laai Hayaat to aaye qaza le chali chaley/ apni khushi na aaye, na apni khushi chaley'. (I was given life so I came, and eternity is here to take me away, so I go / I did not come of my choice neither am I going of my own my will). Meer Taqi Meer (1723-1810) contributed considerably in developing Urdu into a language of public use. 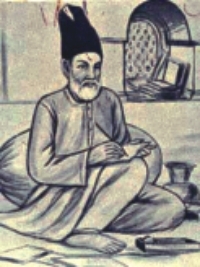 This celebrated predecessor of Ghalib and Zauq can be called the builder of Urdu in its formative years. His language was based in the indigenous expression of local dialect and he blended it with the imagery and idioms of Persian language. Meer's Urdu was simple, natural and at the same time elegant. He was born in Agra but was raised at Delhi. 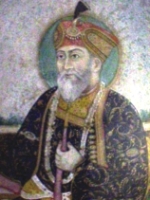 It was savaged by Ahmad Shah Abdali of Persia and Meer left for Lucknow. There he took the patronage of Asafuddowla of Lucknow. One typical Meer poem was one he recited to counter the bantering of the elites of Lucknow mocking his battered condition: 'Kiya bood u baash poocho ho poorab kai saakino /hum ko gareeb jaan kai huns huns pukaar kai / Dilli jo aik shahar tha aalam mai intikhaab /rahtay thay hee jahaan muntakhib roozgaar kay /us ko falak nai loot kay weeraan kar diya /hum rahnay waalay hain usee ujray dayaar kai'. (Ye the residents of the east what are you mocking at to know about my where abouts and my origin/ finding me poor addressing me mockingly/ once there was a city of Delhi a select place of the world/where only the chosen professionals lived/ the heavens have looted it to make it a desolate place/I am the resident of that devastated land). Many have followed Meer, Zauq, Ghalib, Zafar and Daag. Modern India maintained its love for Urdu in Jigr Moradabadi, Josh Malihabadi, Kaifi Azmi and today has Gulzar and Javed Akhtar. The trend of unbound mind, resolute pride, soaring imagination and fulfillment in philosophy continue. Pakistan, on the other hand, was served by two outstanding poets of Urdu - Dr. Muhammed Iqbal and Faiz Ahmed Faiz. Both of them were highly enlightened and received western education. Allama Iqbal is credited for his valuable role in the development of Muslim nationalism among the ethnic groups of Pakistan. His 'Shikwa' and 'Jawab-e-Shikwa' are one of the finest forms of philosophical discourse with the divine being. They sought the cause of the fall of Muslems from eminence and the answers in the form of indictment of the erring Muslems. The poetical works were useful in bringing about national cohesion among these ethnic groups of the west. elements of Indian patriotism in it when he sings his love for the land, Sare jahan se achcha hindostan hamara /hum bulbule hai is ki, ye gulsita hamara //parbat uoh sabse uncha, humsaya asmaa ka /uoh santari hamara, uoh pasban hamara //godi me khelti hai is kee hajaro nadiya/gulshan hai jinke dam se, rask-e-janan hamara //majhab nahee sikhata apas me bair rakhna /hindee hai hum, watan hai hindostan hamara' // (Our Hindustan is the finest country on the face of the earth/ we are her nightingales, she is our rose garden// our mountain towers above all, a neighbour of the sky/she is our sentinel, the defender of us/ a thousand rivers play in her lap,/ the gardens draw sustenance from them, she is our pride our dear land / religion does not teach us to breed enmity among us/ we are 'Hindee' and Hindustan is ours). Faiz Ahmed Faiz had the cause of the poor in his heart and possessed a progressive outlook. His critics branded him a Marxist more so because he received the Lenin Peace Award from the Soviet Union. A Master's in English from England and a retired Lieutenant Colonel of the British Army Faiz suffered from time to time in Pakistan. He was implicated in the Rawalpindi conspiracy case of 1951 and languished in jail for four years. Faiz is a poet in the mould of Ghalib - committed and serious. One of his ghazals found much popularity through the golden voice of Mehdi Hassan. 'Gulon mei rang bhare baad-e-naubahar chalei/ Chale bhi aao ke gulshan ka karobar chale.' (Let the breeze of the return of the spring blow on by putting colour into flowers/ please do come along let the business of the garden continue). However among his departures from his Persianized Urdu 'Raz-e-ulfat' is easy to relish. Raz-e-ulfat chupa ke dekh liya/ dil bahot kuch jala ke dekh liya// aur kya dekhne ko baqi hai / aapse dil laga ke dekh liya// uo mera hoke bhi mera na hue/ unko apna banake dekh liya// aaj us dar se TuuTaati nahi/ ja ke dekha na jake dekh liya'. (I have tried hiding the secrecy of love / by tormenting the heart in many ways// what else is left to be seen/ I have seen the result of falling in love with you// she could not belong to me in spite of being mine/ I have seen the result of taking her as my own// today I have no fascination for that house/I have seen the result of visiting it now let me see the result of not visiting it). Faiz's enlightenment was groomed by western education, teaching and a journalistic career. He started as an English teacher, then pursued a military career and finally settled for a journalistic career as the editor of Imroze and The Pakistan Times. His English wife Alys Faiz also had great influence on him. He was a down to earth man and let his imagination to behold life in its transient form 'Bahut mila na mila zindagi se gaam kya hai/ mataa-e-dard baham hai to besh-o- kam kya hai //hum ek umar se waqif hai ab na samjhao/ ke lutf kya hai mehrabaa sitam kya hai'. (What is the use holding a grudge against life, what you got and what you do not have/ when the effects of pain are all in one what is the difference between having more or having little/ I am aware of a life spent now don't counsel me/ as to what is the taste of life and my dear what is there in pain). The women of Pakistan in general present a picture of chadar (cloth spread over the upper half of the body) and chardiwari (the confines of the house). They are identified with the role model of being virtuous, dependent, diffident, self-effacing and belonging to the four walls of the house. Things became much too restrictive with the introduction of 'Hudood law' (penal law). In its extremity it shrunk the dimensions of a woman's life. This resulted in the appearance of a group of assertive women using Urdu poetry as the medium for focusing their injuries, their subservient status and for upholding the rights of women. Most prominent among them are Fehmida Riyaz, Kishwar Naheed, Parveen Shakir, Ishrat Afreen and Ada Jafery. The muzmun or the theme of the poems dealt with female experiences in a man's world. They are particularly critical of the social comprehension of women by the obtrusive standard of virtue that predominantly treats women as sexual beings. Urdu was born in Mughal tents. The Mughals spoke Turko-Persian, learnt Arabic. But the locals spoke Hindustani. Persian and Arabic blended with Hindustani. A new language Urdu was born. The Mughals patronised it and started cultivating it as a convenient medium for interaction with the indigenous expression. Although the Mughals perished, Urdu survived and came out of the royal garb. It is now prospering as a modern language. The legacy of Urdu came from the Mughals and its practitioners perpetuate their memories, of Bahadur Shah Zafar in particular. God has in a way fulfilled his wish of Umre daraz or long life. The dead Zafar is not badnaseebi or unfortunate when so many speak his language.